Brendan discusses his early impressions of the Renegade Games title from Reiner Stockhausen, Altiplano. Join us to find out how the game plays and what you can expect. Have you had a chance to play Altiplano yet? Let us know what you thought over on BoardGameGeek guild #3269. 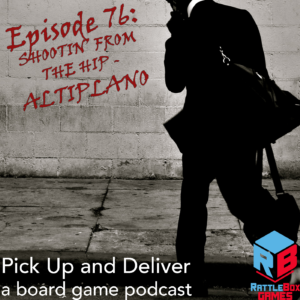 ← Pick Up and Deliver podcast 075: How well do you know your gaming partners?